The Samsung Galaxy S10 is now the most-anticipated device for several reasons. The handset is expected to come with some entirely new features. More importantly, many are anxiously waiting to see what design Samsung will go with — especially whether or not it comes with a notch. Now a new patent offers quite a few hints on this front. Although we can’t know for certain if the technology will be used in Samsung’s next device, many believe it to be a Galaxy S10 patent. This alleged Galaxy S10 patent, which was first discovered by the Dutch-language site LetsGoDigital, reveals 12 potential display designs for the handset. All the designs have two things in common: a hole or cut-out in the top-left corner and an edge-to-edge display. All designs show varying display shapes like curved edges, round and even flat panels. Samsung’s latest patent application includes only visual material and no text. It must be noted that the images in the patent are in line with the latest rumors about the Galaxy S10, some of which hint that the S10 will have an “Infinity-O display.” Samsung showcased the same display at its developer conference last week. The Infinity-O display was shown with a nearly edge-to-edge display and a small, circular hole near the top. Such rumors have led to speculations that the front-facing camera in the S10 could be fitted inside the display hole. Such a setting would help Samsung avoid including a notch, which has become pretty common in phones launched this year. According to the Dutch-language site, the patent was submitted to the Hague International Design System, which is monitored by the World International Property Organization (WIPO). Another report from Korean-language site TheElec claims the handset could feature a zero-bezel OLED screen, meaning it wouldn’t have top or bottom bezels. Further, the report claims the display will have two holes at the top: one for the camera and the other for an infrared sensor. All the other sensors usually found in a smartphone will reportedly be put under the screen. 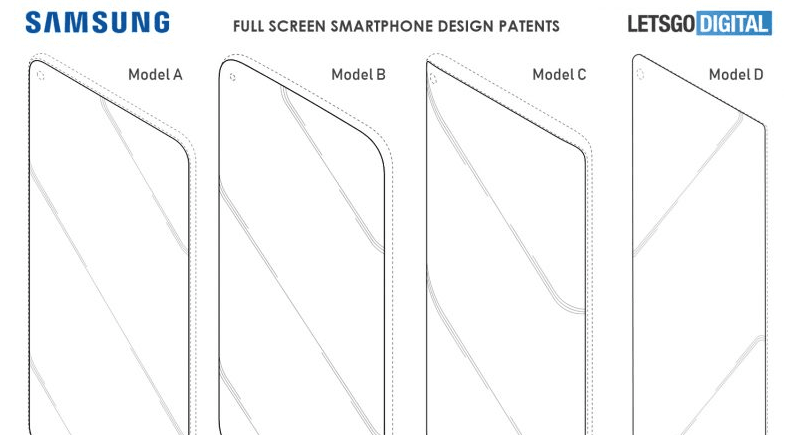 Additionally, the report indicates that Samsung Display is currently developing these screens. The company is reportedly using diode-pumped solid-state (DPSS) lasers to make the holes in the screen. For this new type of display, Samsung is also reportedly developing a user interface to accommodate the holes. The status bar on the top would reportedly display information on either side of the hole. The information displayed would likely include the cellular antenna signal, time, carrier name, battery life and more. To ensure a seamless user experience, a black border would supposedly hide the camera when the device is playing a video. Since manufacturing such displays is a risky bet, Samsung has a backup plan as well, the report says. Plan B involves putting a small L-shaped notch on the top-right or left side of the display. The notch would house the camera and other sensors. It must be noted that Samsung did showcase other displays with such a notch at its developer conference as well. For instance, the Infinity-U and Infinity-V screens were shown with tiny notches at the top. This potential Galaxy S10 patent does not reveal the handset’s rear side, but reports suggest the handset could feature a horizontal camera setup which allows space for a larger battery. There are speculations that the handset will sport a triple-lens camera on the rear, similar to the setup seen in the 2018 Galaxy A7. However, the sensors will reportedly be different from those on the A7. Speculations suggest the S10 could feature a standard + wide + telephoto lens setup. Huawei used a similar setup for the P20 Pro. Samsung is expected to release three S10 variants: a cheaper model possiblycalled the S10 Lite, a standard model, and a bigger variant called the S10 Plus. Two variants are expected to feature a 5.8-inch display, while the third one could be the successor to the Galaxy S9 Plus. The S10 Lite will reportedly have a flat display and side-mounted fingerprint sensor. For the operating system, the Korean firm will probably use the newly-launched Samsung One UI, which is based on Android Pie. As far as the release date, almost all the reports and rumors point to a launch in February during the Mobile World Congress (MWC) in Barcelona. A February reveal would mean sales starting in early March.